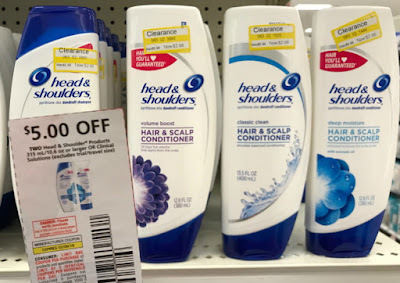 Save big this week on Head & Shoulders Shampoo or Conditioner this week at Target! Take advantage of this clearance price and use the $5.00 off 2 Head & Shoulders Shampoo Coupon in today's P&G Coupon Insert. Makes the shampoo and great stock up price of only 48¢ cents each! To find this item in your store, go to brickseek.com and type in your zip code along with the nine-digit DPCI inventory number: 063-02-3893, 063-02-3892, 063-02-1323 and 063-02-1444.